Vajrayana practitioners supplicate deities and buddhas to help clear obstacles on the path. In this teaching, Thubten Chodron comments on a prayer to the buddha Tara to protect us from the eight dangers. 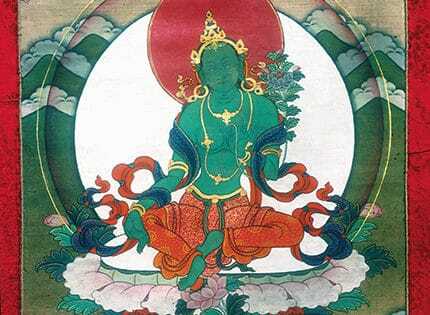 Tara is one of the most beloved buddhas in Tibetan Buddhism. Her name means “the liberator.” She liberates us from ignorance, which is the root of cyclic existence, and from self-centered thought, which impedes us from attaining the full awakening of a buddha. She also liberates us from the eight dangers, each of which has an outer and inner aspect: the lion of arrogance, elephant of ignorance, fire of anger, snake of jealousy, thieves of wrong views, chain of miserliness, flood of attachment, and carnivorous demon of doubt. How does Tara liberate and protect us from danger? It is not by swooping down and carrying us away to heaven or by making a problematic situation magically disappear. Enlightened beings cannot take our defilements away, like pulling a thorn from our foot. Nor can they give us their realizations, like pouring water into an empty bowl. The fundamental way Tara—or any other buddha—benefits sentient beings is by teaching us the dharma and inspiring us to investigate its meaning so we reach a correct understanding. She then guides us in meditation practice so we generate transformative realizations. When requesting Tara to free us, we are actually calling upon our inner Tara—the seeds of our own wisdom and compassion. Through practicing what we learn, we generate the wisdom that realizes emptiness, and through meditating on emptiness, we cleanse our minds of defilements and actualize the cessation of suffering. When requesting Tara to free us, we are actually calling upon our inner Tara—the seeds of our own wisdom and compassion. As we gradually cultivate these qualities, they protect us from the damage inflicted by the disturbing emotions. Tara liberates us by embodying all the realizations of the path. Visualizing her emerald-green form made of light, we contemplate the path and internalize its meaning, as each aspect of her form represents an aspect of the path to awakening. Tara also liberates us by being a role model. Formerly a princess who was told to pray to be reborn as a man, she attained full awakening in a woman’s body, encouraging us to overcome whatever prejudice, discrimination, or discouragement we may encounter. The following verses requesting Tara to protect us from the eight dangers are from “A Crown Ornament for the Wise,” a hymn to Tara composed by Gyalwa Gendun Drubpa, the First Dalai Lama. The lion of arrogance—please protect us from this danger! Just as lions strut in mountainous areas, our arrogance dwells in wrong views concerning the nature of the “I” or “self.” Although the “I” is dependent, ignorance apprehends it as existing independent of all other factors. This wrong view is the root of our suffering in cyclic existence. Holding an unrealistic view of how we exist, we then compare ourselves with others, becoming puffed up over those whom we deem inferior, jealous of those we consider superior, and competitive with equals. Our arrogance begets contempt, which, like a lion’s claws, causes harm. These harmful actions perpetuate our rebirth in unfortunate states of existence. Meanwhile, our arrogance prevents us from recognizing our predicament in cyclic existence. The wisdom that realizes the emptiness of inherent existence is the ultimate antidote to all eight inner dangers, for it sees the true nature of the self—that it is empty of independent or inherent existence. However, since this realization takes time to generate and is difficult to gain, we use other, easier antidotes in the meantime. These temporary antidotes correspond to each particular affliction. In the case of arrogance, we contemplate a difficult topic, such as the twelve sources or eighteen elements, which is essential to understand but difficult to comprehend. Recognizing how limited our current understanding is makes us less arrogant. Another antidote is to reflect that everything we know and every talent and ability we have comes from the kindness of others. People taught and coached us; they encouraged us in all areas. Seeing this, how can we be arrogant, thinking we are so special? The elephant of ignorance—protect us from this danger! Powerful and out of control, a mad elephant terrorizes all in its path. Similarly, uncontrolled emotions, which stem from ignorance, lead to a chaotic life that lacks clear priorities. Intoxicated by ignorant attachment to sense pleasures, we do whatever is necessary to procure what we seek. Ignorance takes us down wrong paths that lead only to confusion and suffering. 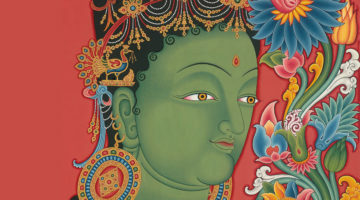 When petitioning Tara for protection, we call forth our own powers of mindfulness and introspective awareness, two active mental factors that perform special functions in the mind. 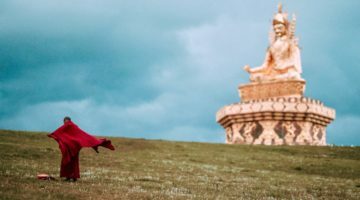 Like a tamer who knows how to subdue a wild elephant and harness its energy for constructive purposes, these mental factors lead us to ethical behavior and meditative concentration. The Sanskrit word that is translated as “mindfulness” can also be translated as “remember” or “memory.” So with respect to ethical conduct, mindfulness remembers our precepts and holds our values, and introspective awareness enables us to see if we are living within them. In the context of meditation, mindfulness is what focuses on the object of meditation and holds it so it is not forgotten, and introspective awareness is like a spy—a corner of our mind that investigates whether distraction, dullness, or excitement has set in, interfering with our meditation. The fire of anger—protect us from this danger! Like a raging fire, anger begins with a tiny spark. Fueled by the wind of inappropriate attention that focuses on the negative qualities of someone or something, often exaggerating them, anger flares up. Blazing, it destroys merit and creates destructive karma that ripens into suffering. Fortitude, the ability to remain internally calm when confronting harm or suffering, is the antidote to anger. Fortitude does not entail passively giving in or foolishly condoning harm. Rather, it enables clear thinking, mental stability, and creative problem solving. We consider various courses of action and choose one that will bring the most benefit and least harm to everyone in the situation. With fortitude we act firmly, sometimes with peaceful strength, other times with assertive compassion. The snake of jealousy—protect us from this danger! Jealousy, like other disturbing emotions, stems from ignorance of the nature of reality. Like a snake whose venom kills a healthy person, jealousy poisons the happiness and goodness of ourselves and others. Overcome by jealousy, we try to demolish the happiness and success of those we envy. But ultimately such behavior is self-defeating, because even if we succeed, we do not feel good about ourselves when we undermine another’s well-being. Such spiteful jealousy not only lessens our own self-respect, it also suffocates our mental peace. Enlightened beings cannot take our defilements away, like pulling a thorn from our foot. Nor can they give us their realizations, like pouring water into an empty bowl. Rejoicing in the happiness, talents, fortune, and good qualities of others is the antidote to jealousy. When others are happy or have good qualities, we might as well rejoice! There is so much suffering in the world; it would be foolish to wish that others be deprived of whatever happiness they have. Rejoicing is the lazy person’s way to create great merit. When we rejoice at others’ virtues, we accumulate merit as if we had acted in those beneficial ways ourselves. Rejoicing spurs us along the path to awakening and also brings us immediate happiness. The thieves of wrong views—protect us from this danger! Just as we protect our treasured possessions from thieves, we must take care that our right views on important spiritual matters are safeguarded. Adhering to wrong views causes us to engage in practices that purportedly lead to awakening but actually do not. They leave us impoverished, stranded in a spiritual desert. We might be surprised to discover the number of wrong views we hold and the stubborn tenacity with which we hold them. When someone challenges our wrong views, we become upset and defensive. We may even disparage dharma teachings when they do not agree with our opinions. The chief wrong views hold to the two extremes: absolutism and nihilism. Absolutism reifies the way in which phenomena exist, whereas nihilism negates aspects of their existence. While all persons and phenomena are empty of independent existence, absolutism holds that they exist independently, with their own inherent essence. Nihilism goes to the other extreme, disparaging the functioning of cause and effect. Adhering to either absolutism or nihilism prevents us from properly understanding both the ultimate nature and the conventional nature of phenomena. The Middle Way view enables us to distinguish accurately between what exists and what doesn’t, and to know what to practice and what to abandon. The chain of miserliness—protect us from this danger! Craving for the enjoyments of cyclic existence and the miserliness it produces chains us to suffering. We cling to our possessions, unable to part with them, and hoard our knowledge. It’s easy to think we’re generous and magnanimous when we read this. We say to ourselves, “I’m not attached. I’d be happy to share whatever I have with others.” But should somebody ask us for our lunch, we may respond, “No, I’m hungry!” Or if somebody took our shoes from outside the meditation hall, we would be upset. Believing that possessions will bring us security in cyclic existence, we fear that if we give things to others, we won’t have what we need. In fact, our miserliness keeps us bound in a prison of discontent. We constantly crave more and better, never satisfied with what we have. Nonclinging and generosity are the antidotes to miserliness. With nonclinging we don’t conceive of material possessions as a reliable source of happiness or as an indicator of success. We discover contentment, a rare “commodity” in our materialistic society. Contentment allows us to cultivate the love that wishes others to have happiness, which in turn stimulates the mind that takes delight in giving. Giving with an open heart brings us joy and directly benefits others. The flood of attachment—protect us from this danger! Like a flood, attachment sweeps over us, propelling us helplessly into the stormy ocean of cyclic existence. Under the influence of attachment to people, possessions, praise, power, and reputation, we harm others to get what we want. Our destructive actions create conflict and leave karmic seeds that produce suffering later on. In addition, at the time of death, strong attachment arises and we cling to our body and life. When we realize we cannot hold on to them, attachment then grasps another body and life, and rebirth occurs. The mind of attachment is narrow and limited. We become obsessed with the object of our attachment; we worry about not getting it and fear losing it once we have it. Drowning in the flood of attachment, we are unable to abide in satisfaction and peace. We need a guiding star to find our way across the dark seas of the disturbing emotions. The Sanskrit noun tara means “star,” and the verb trri means “to guide across” or “to cross over.” The dharma is our raft, and Tara is the star guiding us across cyclic existence to the other shore, nirvana. But Tara can’t do it alone. We must listen, reflect, and meditate on the teachings and transform our mind. Contemplating our transient nature is an excellent antidote to attachment. Seeing that the things we cling to change moment by moment, we know that they will not last long and thus are not reliable sources of happiness. Turning away from their deceptive lure, we have more time to familiarize our minds with bodhicitta and wisdom, progressing along the stages of the bodhisattva path to buddhahood. Reflecting on the disadvantages of cyclic existence is another antidote. If a prisoner believes that prison life isn’t that bad, he will have no interest in freeing himself. Similarly, as long as we believe cyclic existence to be comfortable, we won’t seek liberation. 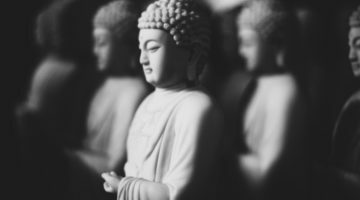 For this reason, in the four noble truths, the Buddha asked us first to reflect on the unsatisfactory nature of our existence and its causes so we might seek their cessation and the path leading to that state of peace. The carnivorous demon of doubt—protect us from this danger! There are various types of doubt, and not all of them are obstructive. The doubt that is curious and open-minded propels us to learn, examine, and clarify the meaning of a teaching; it aids us on the path. However, the doubt that dwells in confusion and leans toward wrong views causes our mind to spiral in circles of its own making and immobilizes us spiritually. Resembling a carnivorous demon, it destroys our chance for liberation. If our mind is spinning in skeptical doubt, when we start to do a practice, we doubt its efficacy and quit doing it. Listening to teachings, we doubt their authenticity and stop attending. We doubt our ability to practice, the ability of our teacher to guide us, the possibility of awakening. Unable to resolve our doubts, we remain stuck and tormented. This demon of doubt obstructs our chance to attain liberation and full awakening. To counteract doubt, we must first stop the flurry of contradictory thoughts and calm our mind. Meditating on the breath dispels discursive thoughts and focuses our attention. A settled mind can distinguish important issues that need consideration from nonsensical, doubting thoughts. Next, we must study the Buddha’s teachings and train our minds in reasoning so we are able to think clearly. In this way, we investigate the teachings, draw out their deeper meanings, and reach correct conclusions. For this reason, Tibetan monastics spend years debating and discussing the scriptures. Although we may not engage in formal debate, discussing topics with dharma friends fulfills the same purpose. We can clarify what we believe and practice accordingly. These are the eight dangers from which Tara protects us. In addition to meditating and applying the antidotes described above, we can visualize Tara in front of us. The green light radiating from her flows into us, filling our body/mind, purifying and eliminating the disturbing emotions and the destructive karma we have created under their influence. 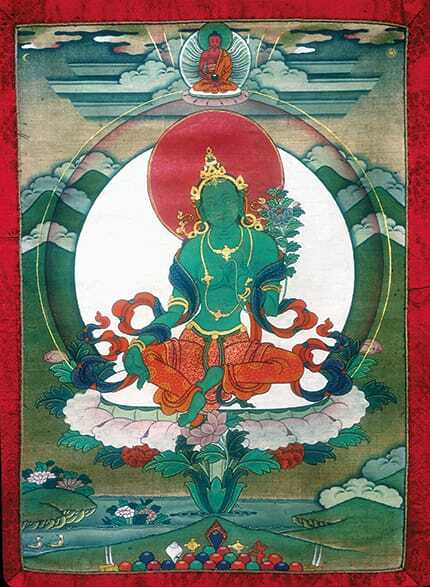 Tara’s blissful green light fills the universe and all the beings within it, liberating them from the eight dangers and enhancing their love, compassion, and wisdom. By meditating on Tara and applying the antidotes to the eight dangers in order to benefit all beings, we create tremendous merit. Directing how we want it to ripen, we then dedicate it: first, for all sentient beings to be free from conditions hindering dharma practice, such as poor health, poverty, and cynicism; and second, to meet all conditions conducive for actualizing the path to awakening, such as long life, requisites for life, the guidance of kind and wise spiritual mentors, and suitable circumstances for study and practice. Although the above verses are phrased in the manner of supplicating Tara to protect us from the various dangers, we must remember that Tara is not an inherently existent external deity. Like all persons and phenomena, she exists dependently and is empty of inherent existence. Although all beings who have become Tara are free from limitations from their side to help others, they are not omnipotent. They can teach, guide, and inspire us only to the extent that we are receptive. Reciting and contemplating these verses opens our minds and hearts to practice their meaning. The more we generate impartial love and compassion for all beings, the more Tara can influence us. The greater our wisdom of the ultimate nature, the more Tara can inspire us to deepen our realizations.